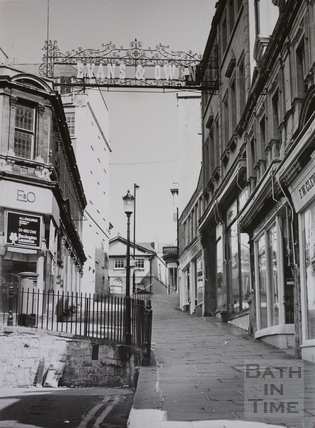 These pictures tell the story of an intriguing restoration project we have in the workshop at the moment.We have been commissioned by the Bartlett Street Antiques Centre in Bath to survey, dismantle and restore this beautiful 6m wide overthrow which has, for many years been hanging high over Bartlett Street, a picturesque pedestrian side street in Georgian Bath’s main shopping district. 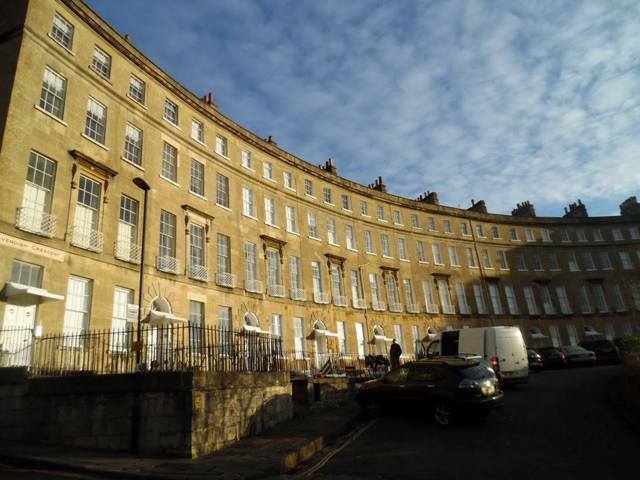 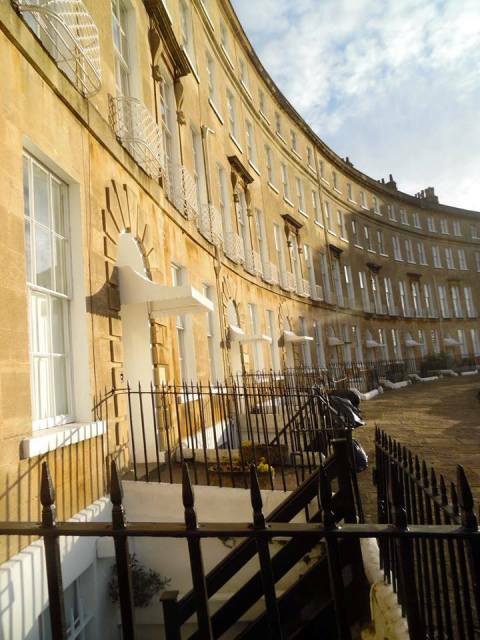 In December and January the Ironart team oversaw the restoration of three zinc canopies decorating Georgian town houses on Cavendish Crescent, Bath. 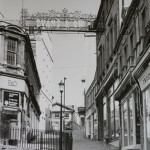 Two of the canopies were very old, with original wrought iron frames of rivetted construction, both covered with solid zinc sheeting. 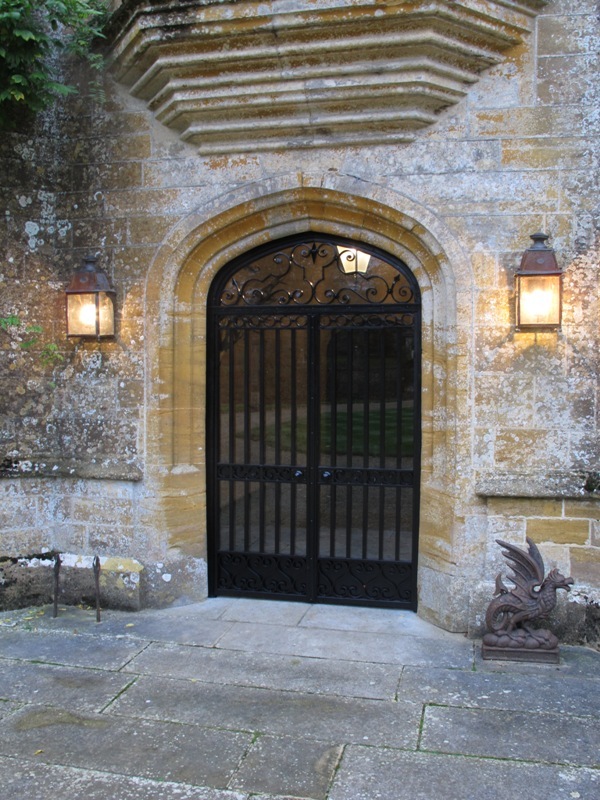 One was clearly a replica, and a recent addition, made from welded aluminium tube frame, also with a solid zinc sheet hood. 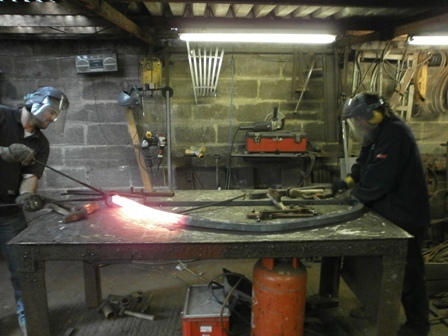 The two canopies that were wrought iron were carefully removed from site, and stripped back to the raw metal. 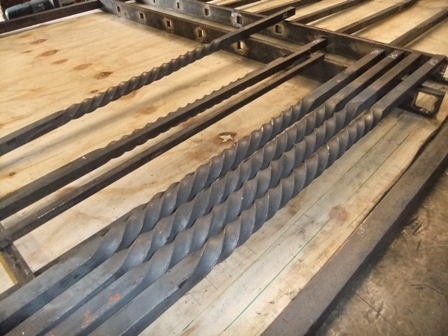 They were then re-coated before being sent to another company (selected by the client) for new zinc sheeting to be applied. 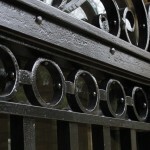 The Ironart team made alterations to the third canopy (the modern replica) so that it was more in keeping with the rest. 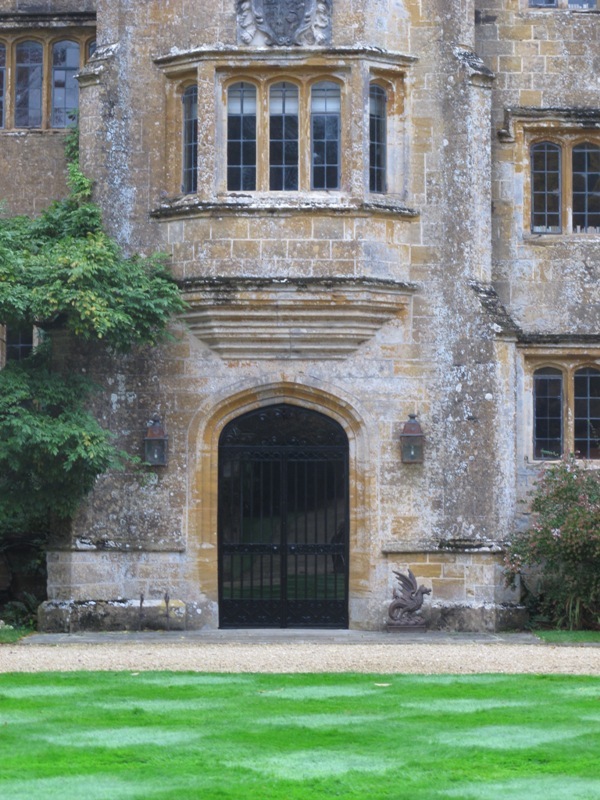 The limestone surrounds into which the door canopies were set had decayed, and frustratingly some of the stonework crumbled when they were removed. 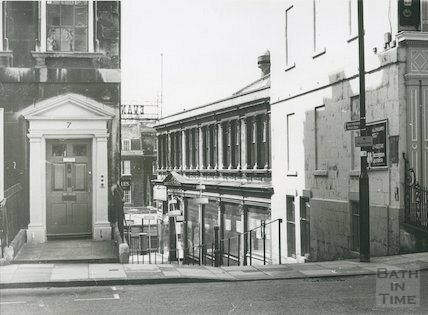 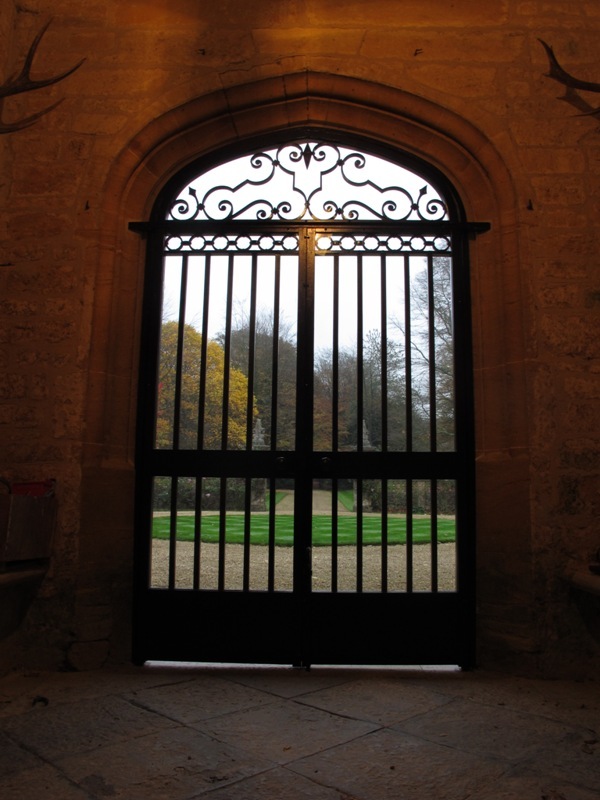 The masonry was carefully ‘made good’ by a local stonemason once the door canopies were refitted on site. 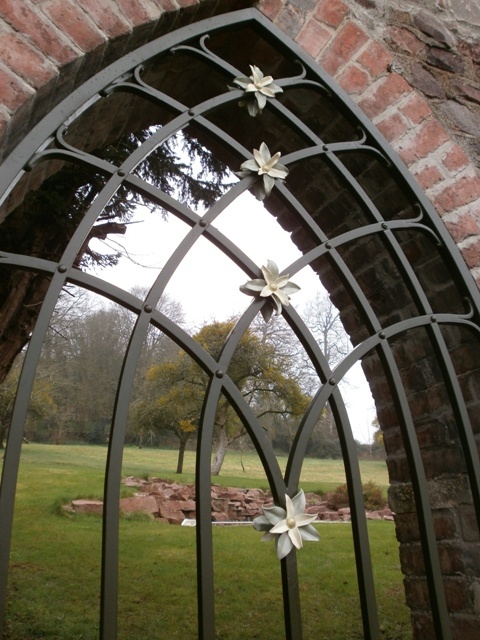 If you are lucky enough to have an historic architectural feature like this on your house and it’s in need of some care or repair, please get in touch because we’d love to help. 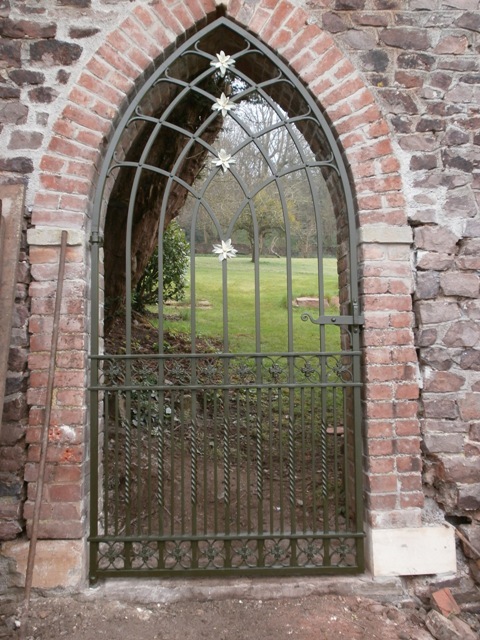 We have just installed a beautiful gothic gate in Bristol. 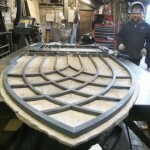 We have already posted a blog piece about the making of this gate while it was in the workshop. 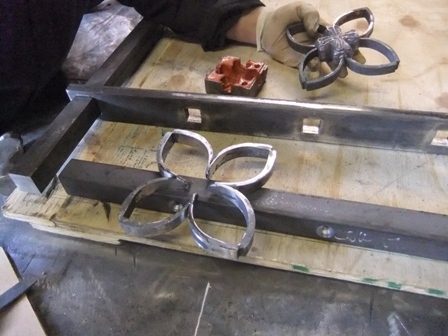 The Ironart workshops have been a positive hive of activity, but apologies for the long silence on the blog front, there has been a great deal going on in the office too! 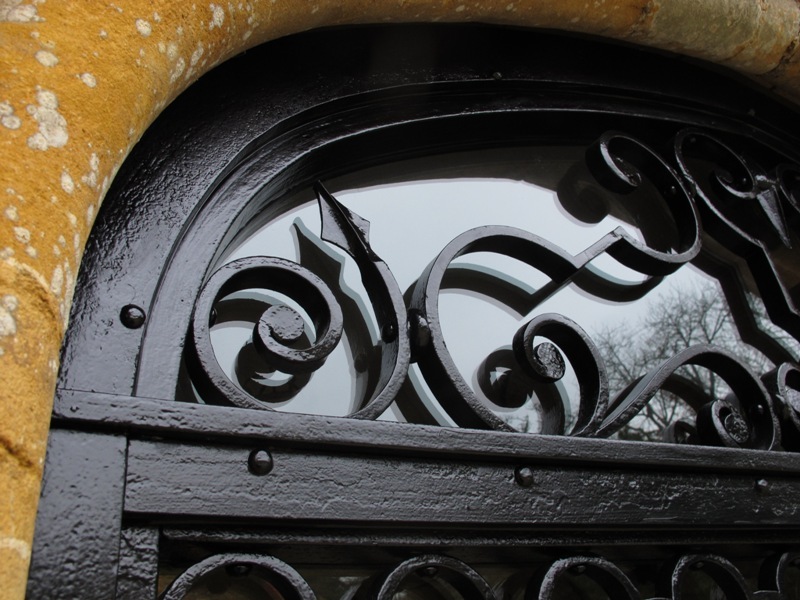 The Ironart team have created a beautiful single gothic-style wrought iron gate for a private customer in Bristol. 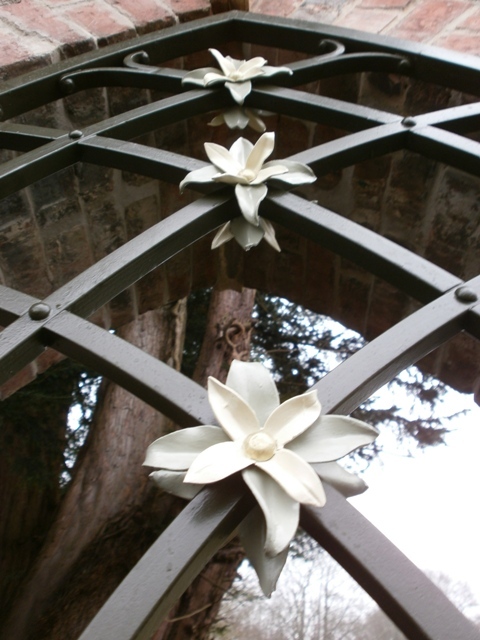 This heavy metal gate has been predominantly made using traditional metalworking techniques and will form the entrance to the walled garden of a Georgian property. 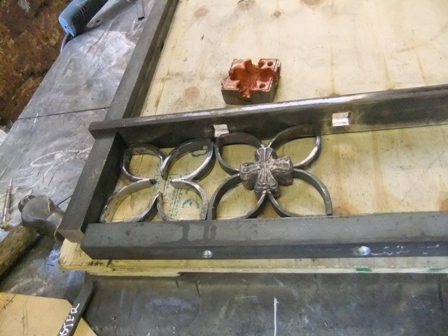 It features cast lead detailing (see images below) for which Martin had to recreate the mould and will eventually incorporate pretty leaf detailing. 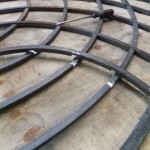 The bars incorporate barley twists which Jason made by hand, these bars feed through punched straps. 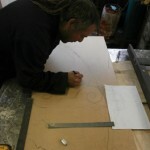 Jason created the halving joins using a micro cutting disk and a plasma cutter. 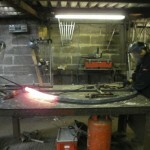 More pics to follow once we’ve installed it. 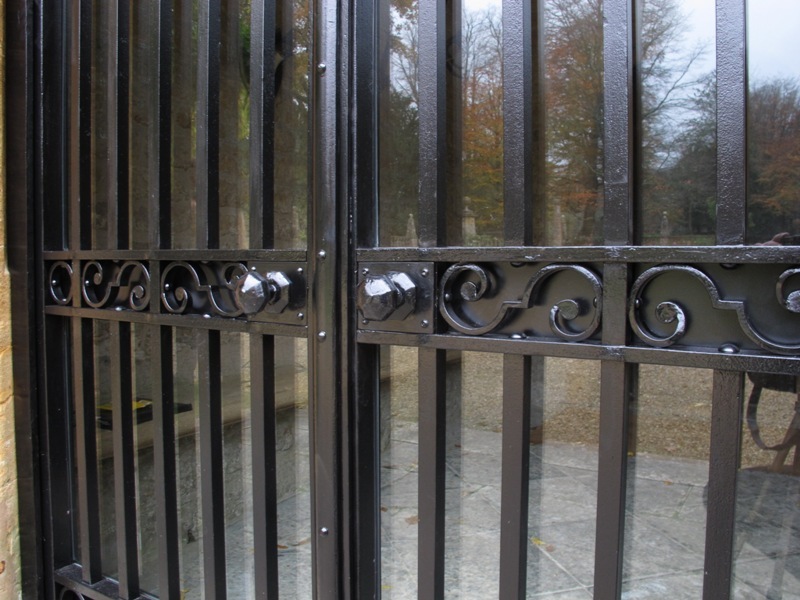 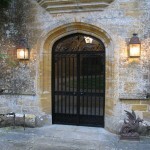 We’ve just installed a unique pair of wrought iron glazed entrance gates on a large private house in the South West. 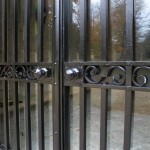 This was a prestigious and very exciting commission as these gates were made by the team here at Ironart using genuine recycled puddled wrought iron and with traditional metalworking techniques. 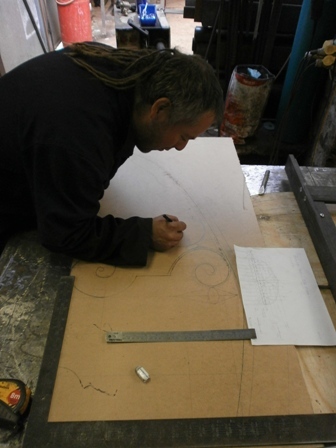 Andy designed the gates in collaboration with the architects, and Jason led the team who realised the project here in the Ironart workshops. 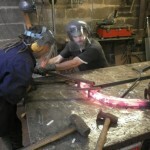 Dom and Jason were bending the frame for a curved overthrow this week. 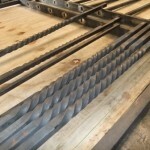 They were working with 38mm square bar. 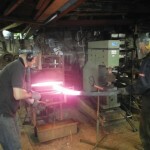 First they created a ‘former’ which they welded to the bench. 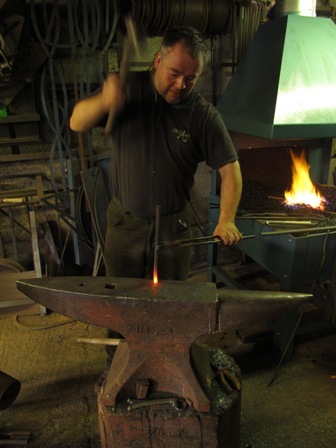 They heated the component in the forge and shaped it a piece at a time. 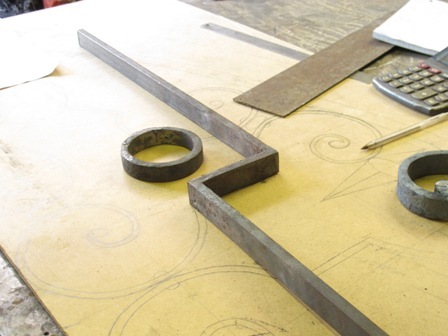 This was time-consuming and hot work! 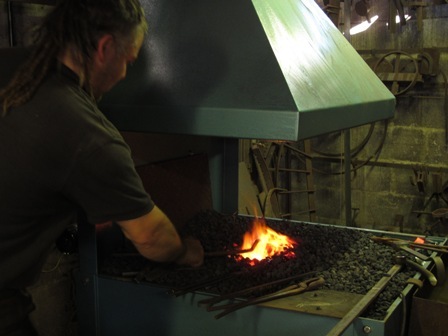 The bar could only be heated 14 inches per time – it took several hours, but the results were very satisfying. 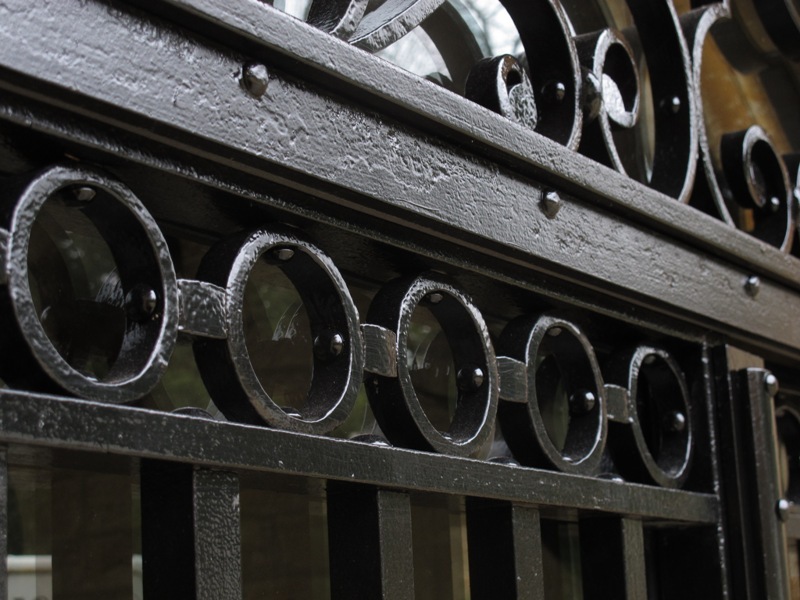 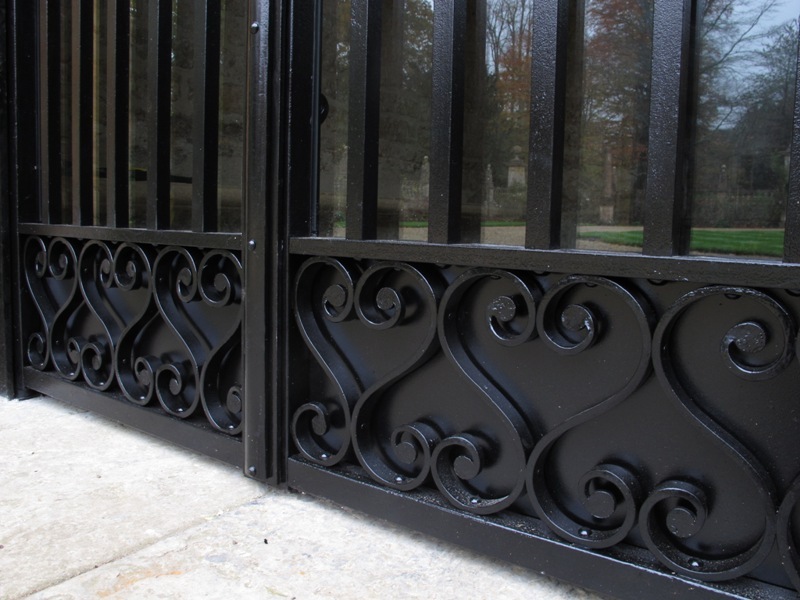 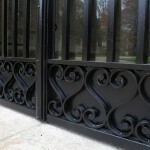 Read more Ironart blogs about the making of these traditional gates. 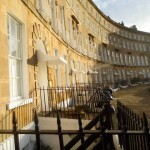 These scrolls belong to a beautiful listed Georgian house in Camden Crescent, Bath. 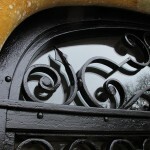 Ironart have been commissioned to restore the ironwork on the face of the building. 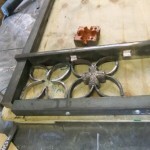 These images show the scrolls being flame cleaned to remove the old paint. 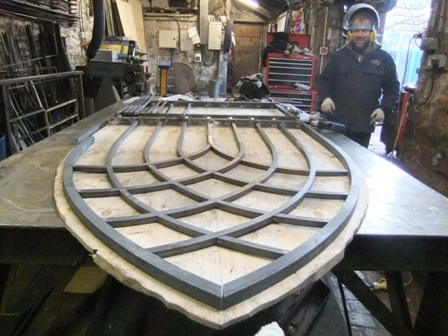 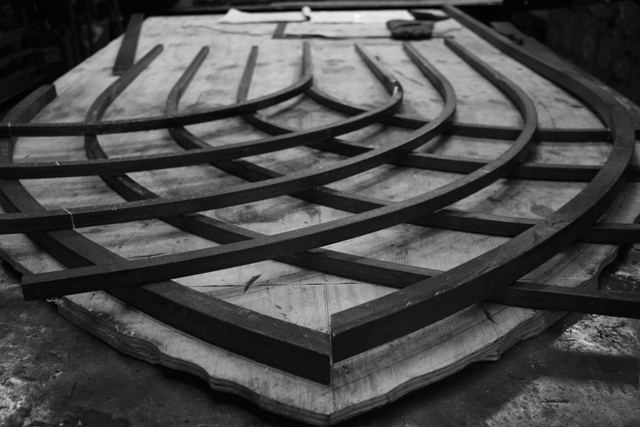 We are working on a pair of traditionally made porch gates for a prestigious Grade 1 listed stately home in Dorset. 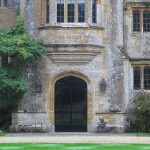 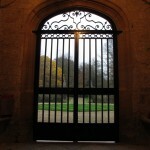 The gates are for a narrow opening, with a decorative scrolled fanlight overthrow. 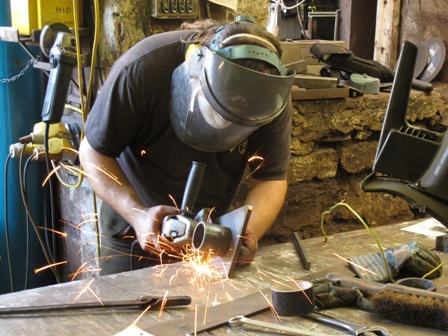 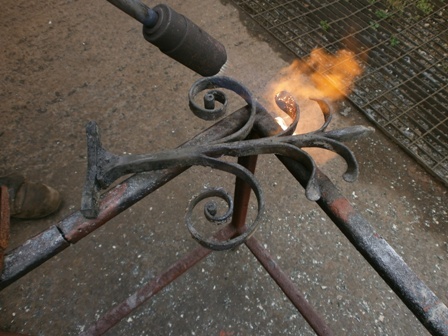 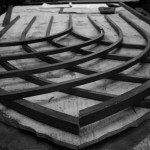 The gates will be entirely traditionally made, with penny-end scrolls, forged square corners and firewelded branch welds. 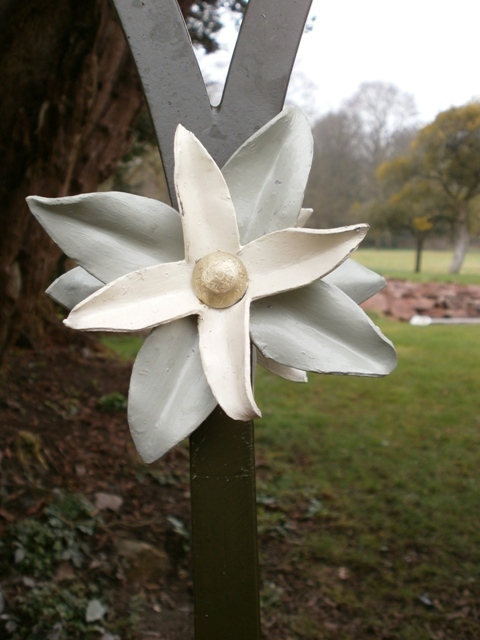 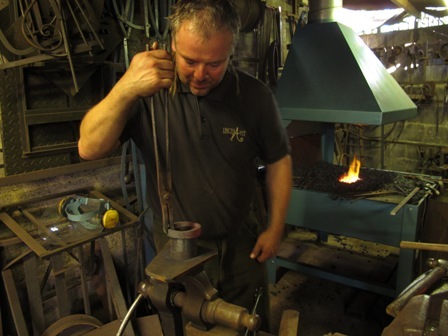 We love this kind of project as it gives everyone in the workshop a chance to flex their finely honed forging skills and get back to the original and best methods of metalworking. 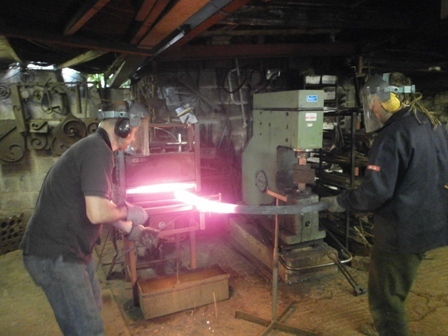 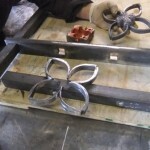 These pictures show Jason making hand forged rings with firewelded scarf joints. 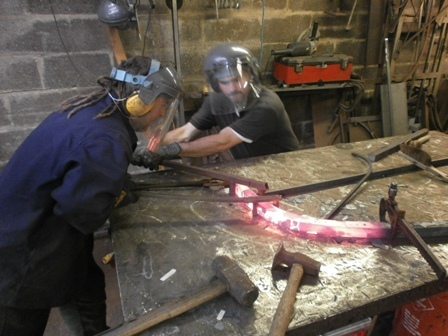 He’s working on the new forge to heat and upset the bar (making the ends fatter) before creating each scarf joint. 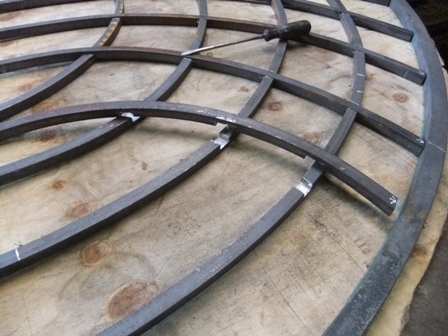 He does this by roughly forming the material into a circle around his template, so that the joints are nesting together. 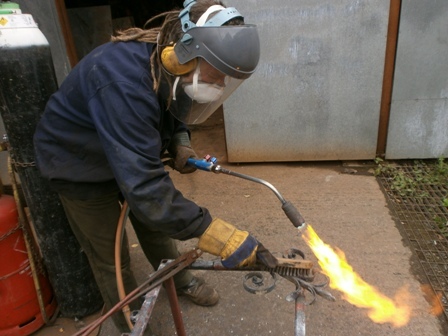 The circle is heated again to firewelding temperature and the weld is finally formed with precise but gentle blows of the hammer.